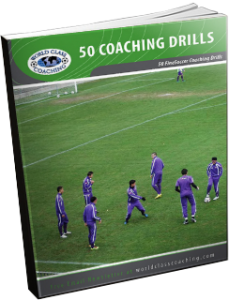 This drill calls for players to communicate, execute high quality passes and time their runs. • The sequence starts again with Player B in the middle with the ball, where Player A had started. Correct Foot – in the above diagram when B receives the 1-2 pass from C, the pass played into D should be with the left foot. The ball should be allowed to run across B’s body to the outsid (in this case left) foot to play into D one time. 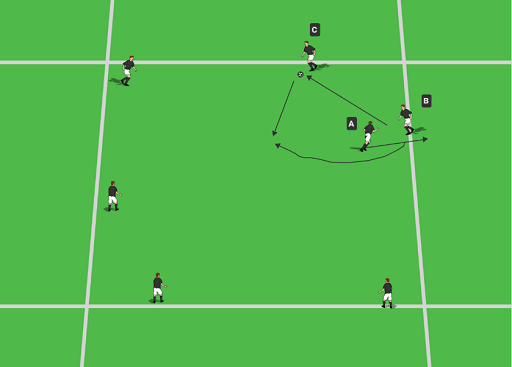 Set Up – Keep the same circle but now add more players into the middle, each with a ball. This depends on the number of players and how dificult (crowded in the middle) you wish to make it. In the below diagram (5) there are 3 players in the middle with a ball and 8 players on the outside. A ratio of just less than half the number of players in the outside circle is a good guideline. We are still playing a 1-2, just in a slightly different manner, that also allows for more outside stimuli for the player to deal with, more technical skills, and more decision making and anticipation. Each player in the middle is free to dribble towards any player on the outside and play a 1-2 combination, whereby they switch and become the outside player. Once they make the pass to the outside player’s feet, they break to either side of them at roughly a 45 degree angle to receive a return pass. They must turn and rotate their body so that they are now facing into the middle of the circle when they receive the ball. The player on the outside, after making the pass back, breaks into the middle to receive the final pass back in the 1-2 combination. Now they are in the middle. They must find another player on the outside and repeat the action of the 1-2. This is a continuous drill that doesn’t stop. Make sure the players communicate and heads are up and aware. They should call out the name of the player they are passing to BEFORE making the pass. Be ready and aware to keep the ball and adjust by going to another player, in case someone else passes to the same teammate. Quality of the Pass – The intial pass must be accurate and weighted properly. The inside player must then quickly move to the correction position. The weight and accuracy of the second pass is also crucial as it must be timed and weighted properly so that the first player can get turned facing the middle and receive the ball with the outside foot. In order to player a quick 1-2 in small spaces the player must be off the shoulder of the defender (inthis case imaginary) and get into an open body position. This way, the ball can roll across the body so they can take it with the outside foot, allowing them to play an accurate one touch return pass. Players need to keep their heads up as the middle of the circle can get crowded. Keep the ball close to the feet and work in the instep dribble. Make the second and third passes of the three pass sequence (the two passes that are the 1-2 combo), one touch passes. Make each player make a move and change direction while dribbling before choosing a teammate for the 1-2 combo. Use the other dribblers as defenders. They MUST make a move and change direction before making a pass. This can includes moves such as a lunge fake, scissors, step over, Mathews, double scissors, twistoff, etc. You can add more choices instead of just making it a 1-2 combination. The players would then have to call out (before making the pass) what they want. Common options include “Back!” in which the outside player just plays a one touch pass back and they stay on the outside. A second option is “Hold!” where the outside player keeps the intial pass and dribbles into the middle to choose someone to pass to. The player who said “Hold” takes the position on the outside. The other option (besides ‘One Two” is “Overlap!” In this case, the middle player says “Overlap!” and plays a pass to a player on the outside. They then proceed to run around (overlap) that player, who lays the ball off for them. A good coaching point here is to coach the receiver of the pass to take a touch away from the side the player will come out on before making the pass. In a game, it’s this touch that takes the defender away from the space where the overlapping player is making their run. Now your players have four choices, two where they switch with the outside player and two where they continue to another outside player.